And now, on this first non-Miyazaki “Miyazaki” Monday, my nominee for the “Saddest Movie Ever Made” award: Grave of the Fireflies! 1988 was a great year for Studio Ghibli. While Hayao Miyazaki was working on what is arguably his masterpiece (namely, My Neighbor Totoro, of course! ), Isao Takahata was working on what is certainly his masterpiece, and another one of Studio Ghilbli’s greatest works. However, these two excellent films could not possibly be more different in tone and content. Unlike the unadulterated glee I felt after last week’s viewing of Totoro, this week’s Miyazaki Monday left me sniffling and sobbing and using up tissues — but, you know, in a good way. 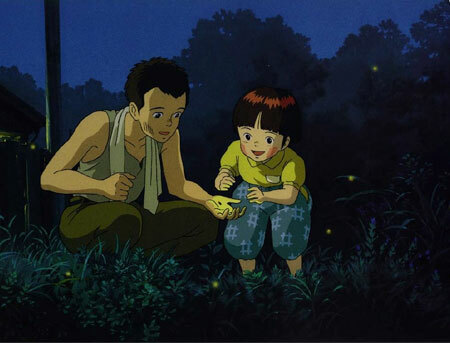 Despite, or perhaps in part because of, its sadness, Grave of the Fireflies is one of the most powerful animated films ever created. I’m having a hard time even beginning to describe what makes this thoroughly brutal film so very special. Taking place during World War II in a rural Japanese village, it is a war movie (and also one of the best war movies I’ve seen, second only to The Thin Red Line in my opinion — and followed closely by the very similar Life is Beautiful). It is a story of death and separation, and that without any earthly reunion or resolution. It is the story of a brother’s care for his sister, of his creation of joy and hope for her in the midst of desolation, even when he cannot shield her from the sorrows of the war. It is the story of those who are helpless, ill, forsaken. And it is a story of resignation and submission to the ravages of war, though longing for peace. It is, once again, simply brilliant. The musical score is beautiful, even without the aid of Joe Hisaishi’s skillful work. Disney was not involved in distributing this film in America, so the voice acting is composed of a lesser-known set of individuals. Still, the English track is appropriate and well done. But as I’ve said, these technical trappings are far from important in this case — the film’s beauty and power would communicate even in silence, I think. What else can I say? Go watch it. It’ll be worth the time.